In no way helping alleviate the notion that police officers can be bullies with perpetual adolescent power fantasies, i09 reports on a story that originally appeared in the Lexington Herald-Reader about a small Kentucky city’s police force that, under criticism, removed the logo of Marvel Comics’ premier sadistic murderer, The Punisher, from the hoods of eight of their cruisers. 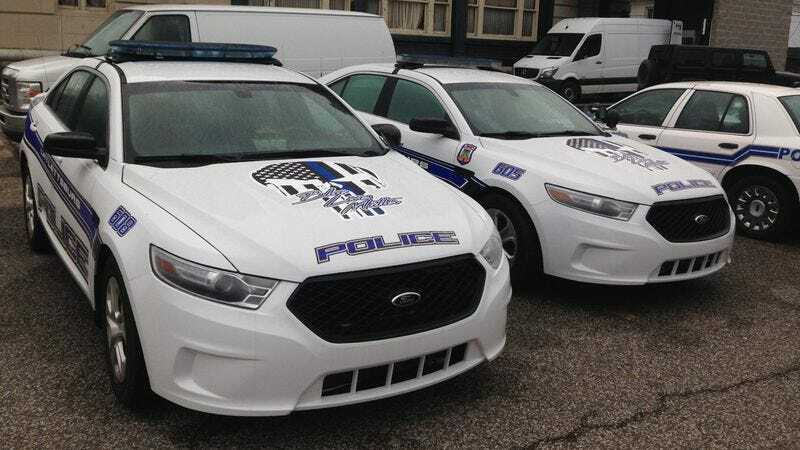 The decals, approved by the city of Catlettsburg and taxpayer funded, also included the phrase “Blue Lives Matter”. They were commissioned by police chief Cameron Logan in support of house bill that makes attacking a police officer a hate crime. Our lives matter just as much as anybody’s. … I’m not racist or anything like that, I’m not trying to stir anything up like that. I consider it to be a ‘warrior logo.’ Just cause it has ‘Blue Lives Matter’ on the hood, all lives matter. That decal represents that we will take any means necessary to keep our community safe. Which is a good reminder it’s worth spending more time reflecting on the meaning behind your imagery than a 17-year-old who lies about their age in order to get their first tattoo. If you’re trying to make the argument that your chosen profession is deserving of the same legal protection as those who are born into society’s vulnerable margins, you could do better than marking your movement with the icon of an unrepentant murderer. Should the Catlettsburg police be looking for a new hero to emulate, perhaps taxpayer money would be better spent buying each member of the force a copy of Grant Morrison’s All-Star Superman.